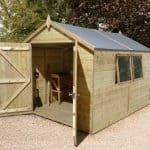 The Shed-Plus collection has a few unique models and this stunning Oriental Shiplap shed is one of them. The exquisite Oriental shaped bargeboards installed on the gables of the building give it a very unusual, eye catching design. 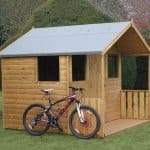 So if you’re looking for a shed that will really stand out, this is a fantastic one to opt for. Created with FSC Certified European softwood, the Shiplap clad walls offer complete weather resistance. There’s also a sharp apex roof included to drain rainwater off the building before it has chance to cause damage. Not to mention the fact that the roof drastically increases the amount of headroom available inside the shed. The manufacturer has used a single, solid door to maximise the amount of space inside the building. This door is secured by a very strong pad bolt and it is hinged to prevent sagging. Three large fixed styrene windows offer a huge amount of light inside the shed, whilst the styrene glazing makes them safer than glass and 100% shatterproof. The only real let down is the solid sheet materials. These are commonly used to save costs for both the manufacturer and the customer. The board is strong enough to hold lightweight equipment, but will need strengthening if you’re wanting to store large, heavy machinery or equipment. OSB materials inside the shed don’t provide much stability. We recommend either not installing the floor and using a concrete base for heavyweight storage, or securing it with another thick sheet of wood. This is a unique storage shed with an Oriental design that makes it really stand out from competitor models. 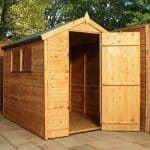 If you’re looking for something different to the standard, traditional apex shed then this is a brilliant alternative. It comes with an incredible height, depth and width. You’re treated to a fantastic spacious interior, with more than enough head height to suit even the tallest of people. The roof itself is an apex variety, though it looks a little different due to the Oriental style bargeboards installed on the gables. This means you get all of the apex benefits, whilst also benefitting from a completely individual look. It’s disappointing the roof is still covered by the same low quality mineral felt as featured on most Shed Store buildings. However, this will still provide a little extra protection against the elements. You can also buy a thicker, more durable felt if preferred, though you will need to find this elsewhere. OSB is used to create the floor. This chipboard style material isn’t very strong and it is largely used to minimise the costs to both you and the manufacturer. Therefore unless you add another solid sheet board on top, we wouldn’t advise using the interior to store heavy machinery or equipment. 12mm Shiplap tongue and groove cladding ensures the walls are extremely durable. Far more superior to overlap, this great cladding type benefits from extreme weather protection. It’s often chosen because it has a much more polished, stylish design. However, if you look at the panels you’ll see they benefit from a unique, slight groove in-between them. This acts as a rainwater barrier and will prevent fungus, rot and other damp issues. As it is also designed with tongue and groove cladding, it is also resistant to high-winds. The panels literally slot together to create a wind resistant interlocking construction. A standard yet effective 28mm x 28mm framing ensures the structure is sound and capable of withstanding all elements. All in all this is a really stable, strong shed that is guaranteed to last. A dip treatment kicks off the sheds 10 year anti rot warranty. This may not be as strong as a pressure treatment, but it does coat the timber with a protective weather-proof layer. 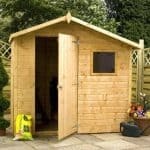 Annual treatments are advised, but you could delay treating the shed for the first time for at least 6 weeks after assembly. A single hinged door has been installed to ensure there is maximum interior space. However, the pad bolt is the only interesting feature included on its design. The fact it doesn’t come with a padlock is disappointing for the price you pay for the shed. However, Shed Store do give you the chance to buy one as an extra. There are three big fixed windows situated next to one another on one side of the building. They allow in a lot of light during the day, though they aren’t openable so they will not supply any air flow into the shed. A lot of detail and quality has gone into the look of this shed, but when it comes to security the manufacturer has slipped a little. A pad bolt allows you to padlock the doors which will significantly boost security. However, the fact that the padlock isn’t actually included is one of the shed’s downfalls. The windows, whilst eliminating privacy, do add to the building’s security as they are shatterproof and cannot be opened. You can also get creative and solve the privacy issue by installing a window covering such as curtains. Four different extras and customisation options are available, with one of the more useful being the security options. There are two alarm padlock options available. The first is the one we recommend and it is a single alarmed padlock. Its unique design means that if somebody tries to remove or pick the lock, an alarm will sound and continue until there are no vibrations or movements. Three keys are included and it is guaranteed to protect your storage all year round. The second option is the Yale Security Kit. As well as an alarmed padlock, this kit also features a hasp and staple. Now technically this does provide more security than a pad bolt. However, with the single alarm padlock, the pad bolt included on the shed will prove effective at ensuring your storage is secure. The second recommended extra is the Wooden DIY Base Kit. If there isn’t a concrete area in your garden, this base will prove valuable in terms of ensuring the shed is stable. The kit comes with ground spikes and it benefits from a great 15 year guarantee. DIY treatments can also help to keep the sheds natural weather resistance topped up. They’re also available in Harvest Gold or Dark Brown so you could change the look of the building whilst providing high quality protection. Finally a solar light is available and this could prove useful if you need to use the shed at night or on dark, winter days. It is extremely affordable, runs off the sun’s rays and does not need to be wired to the mains. It’s one of the simplest and cheapest ways to add light to any outdoor building. We’d love to give this a 10/10 rating for quality purely for its extremely unique design. However, we have to take into account the quality of the entire building. The outside is fantastic. Shiplap cladding is the highest quality material used on outdoor buildings. However, solid sheet materials and a low quality felt on the roof could use some improvements. Designed to last at least 10 years, this is a long lasting shed. However, this only applies if you take the time to treat the shed annually and if you’re careful with what you store. Unless the floor is strengthened, it will not withstand any heavy equipment. There’s a reason this size shed is the most popular size available and that’s because it offers a brilliant level of interior storage room. 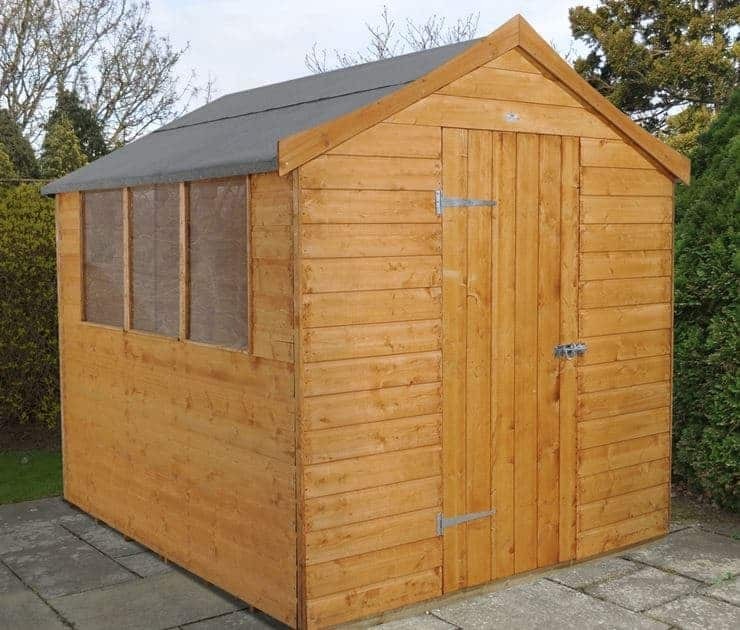 This shed also benefits from an extra tall height making it much easier to store taller equipment. As it does come with such a unique design, this shed is going to be a little more challenging to build than the average shed. The panels are large and heavy so 2 people should always work together to assemble it. 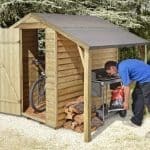 Even though we feel this shed could benefit from some of its features being upgraded, we still think you’re getting a bargain. Its incredible design and high quality exterior make it worth the reasonable price tag. Final Thoughts: The striking Shed-Plus Oriental Shiplap storage shed is one of the more impressive, unusual models available. Offering a large storage area, it benefits from a height boosting apex roof. Three tall styrene glazed windows filter plenty of light into the shed, whilst the large single door is secured via a strong pad bolt. This makes the door pad-lockable, though you will need to buy a padlock separately. Oriental style bargeboards attached to the gables of the shed give it a very stylish, unique and captivating design. 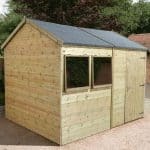 We would recommend upgrading the floor to accommodate heavier storage, but apart from that this shed offers exceptional value for money.